MILWAUKEE -- It is amazing how quickly our weather can change. Today we barely have any snow on the ground, but one week ago we were covered in snow. 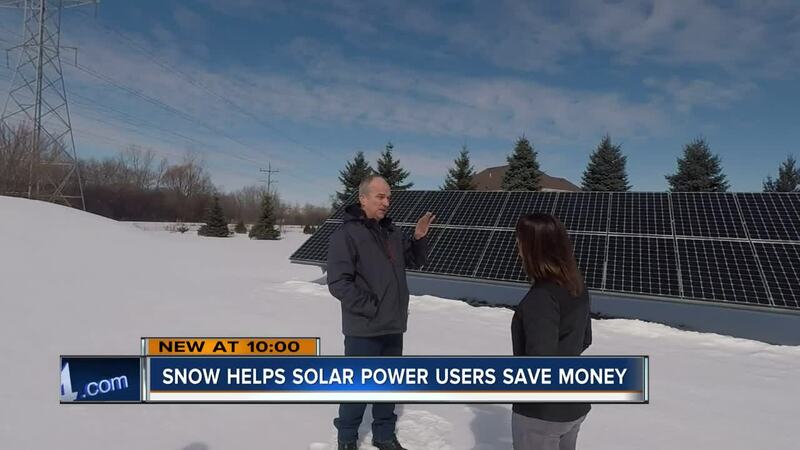 That's when we went to Mequon to see how the snow, the sun and science can combine to lower one man's energy bill. You could call Eric Neusen a bit of a solar pioneer. "This is a 7.26 kilowatt rated system." He had a 22 solar panel system installed in September, right as our hours of sunlight shortened and our temperatures fell, something Neusen was okay with. The panels were installed well before there was any snow on the ground. "In the middle of summer, on a hot day, you've got the asphalt shingles making it even hotter from the backside and you lose efficiency." Neusen chose to place his solar panels on the ground instead of on top of his roof heading into our snowy winter. After clearing the snow off the solar panels a couple times, Neusen noticed something a bit odd on his solar energy readings: a boost of roughly eight percent. Neusen looked into it a bit closer. "So normal production without reflectivity off the snow would have been 7.26 maximum. I'm gaining at least .5 kilowatts, 500 watts." Neusen says, enough extra energy in one day from the snow alone to run a clothes dryer for two hours. This left him as one of the people who didn't hate our snowy season. "No, the snow is working in my favor!" A close-up view of the array. Mike Cornell, Chief Instigation Officer at Arch Electric, the company who installed the system explained how the process works. "When we have a snow situation with a ground mount area, you're able to take advantage of the snow reflecting onto the panels." "The sunlight not only hits the solar panels, but the snow as well, those rays hit the snow and bounce onto the solar panels as well, since snow has a high albedo: meaning that bright, white snow can reflect as much as 90 percent of the sun's rays. That extra reflection can be captured and converted to electricity for Eric and his family." Neusen is excited about the extra energy he gained from the snow, but he's more thrilled about leaving a lasting impression for future generations. "Fossil fuels are not the way to go from here on out, this is one of my ways of doing better than making it worse." And while *our footprints in the snow have melted, Neusen is okay to trade the snow for more sunlight, "Longer days, more electricity."